The University of Wisconsin Parkside has been home of the Midwest Regional for the past 30 years and has spawned the career of many runners who went on to become national champion including Adam Goucher, Jorge Torres, Dathan Ritzenhein, Lukas Verzbicas, Grant Fisher, Megan Goethals, Melody Fairchild and Anna Rohrer. Pick up is on Friday, November 27th between 2:00 p.m. and 8:30 p.m. or at the race site starting at 8:00 a.m. on Saturday, November 28th. Please be aware that if you wait until Saturday to pick up your packet we cannot guarantee that you will be able to pick it up in time for your race. The course is 5000 meters and consists of grass and dirt paths. Spikes are permitted. School uniforms are not allowed. Course is open until dark on Thursday, November 26th and Friday, November 27th. The course is closed for warm-ups on Saturday, November 28th. 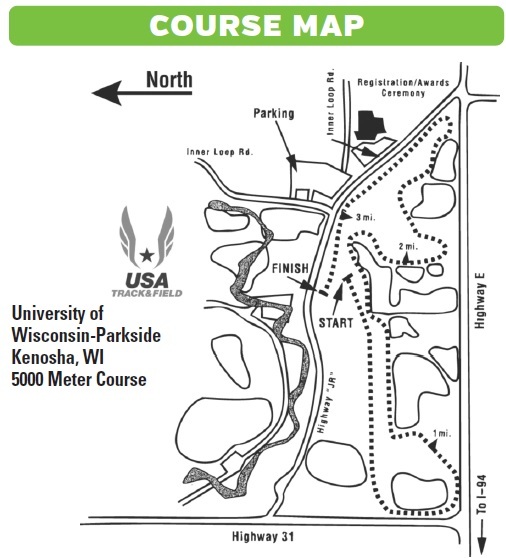 The University of Wisconsin-Parkside race course is located in northern Kenosha County, five miles south of Racine. Milwaukee is 25 miles north. Chicago is 60 miles south. Highway I-94 passes four miles west of the campus. Highway E runs east from I-94 and leads directly to the race course. Qualification for the Boys Seeded race is determined by the runner's previous best time. Junior and Senior boys who have run faster than 16:20 may consider running in the seeded race. 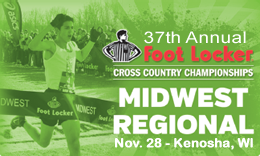 Freshman and Sophomore boys who have run faster than the 16:20 qualifying time have the option of competing in the seeded race or Freshman/Sophomore race. Show up for the race you choose to run. You do not need to inform officials of your choice prior to the run. All Junior and Senior girls must compete in the Girls Seeded race. Freshman and Sophomore girls have the option of competing in the Seeded Race or the Freshman/Sophomore race. Show up for the race you choose to run. You do not need to inform officials of your choice prior to the run. This 5000 meter race is open to runners in the following divisions: Open, and Masters (ages 40 and over). Each entrant will receive a T-shirt. High school runners may not run in the Open Race. The top ten (10) female and male runners in each division will receive a medal. The top twenty-four (24) finishers in all high school races are awarded medals. Medals to the top 15 individuals and top 3 boys and girls teams will be awarded. The top ten finishers in each division (Open and Masters) will receive a medal. 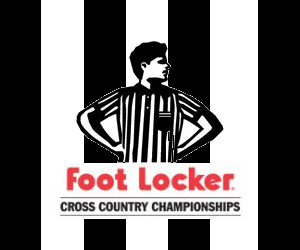 Every runner in every race will receive a T-shirt and a meet program highlighting the previous 36 years of Foot Locker races, as well as previewing this year's race.